As I mentioned in the last Layer Cake post, this British crime drama (some could call it a black comedy) was seen as Daniel Craig’s “audition tape” for the role of Bond. He was a sharply-dressed, sympathetically violent, and stoic Londoner who differed from Bond only by being a gangster instead of a secret agent. Also, Dan’s Layer Cake character was also much better about protecting his name than Bond. For the film’s denoument, Dan’s casual look consists of a dark pinstripe jacket and jeans. The sportcoat* is a dark navy blue pinstripe single-breasted jacket with notch lapels. It fastens in the front with 2 dark blue buttons. There are four smaller matching buttons on each surgeon’s cuff. * Update! Matt Spaiser has made some good points addressing the likelihood that this is, in fact, an orphaned suit jacket rather than a sportcoat. To check out what Matt has to say, visit his blog post from September 2015 or see his comments below. I like to make it look like Dan is yelling at himself. The jacket has a fashionable cut with natural shoulders and deep double rear vents to allow easy movements. There are flapped hip pockets but no breast pocket. The shirt underneath is a white long-sleeve shirt, more casual than most dress shirts. Dan’s gets pretty rumpled from all of the action in these scenes. It buttons down a front placket with white buttons. Both the spread collar and the barrel cuffs have double-button closures. Dan’s shirt gets more and more rumpled as he gets more agitated throughout the day. 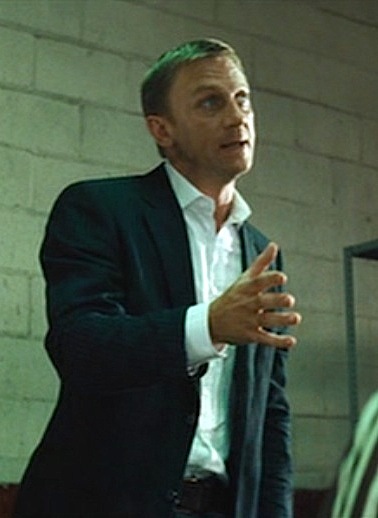 Unlike much of his casual wear in Casino Royale and Quantum of Solace, Dan’s shoes and belt match. Here, he wears a dark brown leather belt through his jeans. It is thick with stitched edges and closes in the front with a large brass 2-eyelet rounded square clasp. The belt matches the shoes perfectly in dark brown leather. As he wears with his other casual attire in Layer Cake, Dan’s Chelsea boots are chestnut-colored R.M. WIlliams “Henley” style with brown elastic side gussets and black soles, worn with a pair of black socks. A pair of versatile leather boots like these are good for both casualwear and dressier attire. Dan’s accessories are a pair of sunglasses and his wristwatch. The glasses are either dark brown or black plastic with dark lenses with what appears to be the Persol logo on the sides. His watch, possibly a Rolex Datejust, is stainless with a black dial and bezel. What do we think, gang? Persol? XXXX also swaps out the white shirt for a light gray t-shirt, which was a better fit with his leather jacket. Everyone wants to walk through a door marked “private.” Therefore, have a good reason to be affluent. Speaking of London-based criminals – you should watch London Boulevard. While the movie itself far from revelation, main character wears some sharp suits (especially the blue one), and movie soundtrack is awesome. I’ll definitely need to check it out! Thanks for the recommendation! This jacket is actually a suit jacket and not a sports coat. Sports coats never have pinstripes. At the time, it was very fashionable to wear a suit jacket with jeans. It still kind of is, but well-dressed men know better. I’ve been noticing it is a character trademark on Justified; the lead character has about three or four suits and often orphans the jackets with his jeans. I am probably more forgiving of this look, but I don’t disagree that it can be very sloppy. Thanks for clearing up the suit vs. sport jacket question; I think my perspective has been clouded by seeing a number of designers in recent years coming out with sport coats utilizing traditional suit patterns, which wasn’t done even ten years ago. You have a very refined sense of style, Matt. When and how do you wear jeans? Well, I don’t wear jeans at all! But if you’re going to wear jeans with a jacket, Robert Redford showed how it’s done in Three Days of the Condor. It works because the jacket is very informal. A business-like suit jacket with jeans just doesn’t work for me because of the clash of formality. But I can see how the clash of formality might appeal to some people. I’ve never seen Justified, but I’ve always admired Timothy Olyphant’s hair! Much appreciate the feedback! Redford in Condor was actually one of the reasons I started this blog, and it was one of my first posts. The idea of a suit jacket (or even a sport coat) with jeans was unappealing to me a few years ago, but I have a job that inspires casual dress and I’m appreciating the benefits of experimenting with similar looks. And, yes, Olyphant has an excellent head of hair! His jacket is technically not a sports coat more a blazer or it looks like the jacket off a suit he has paired with jeans for a more casual look. Thanks, Ryan! Sadly, this post is one of a number of my earlier posts that could use a heavy revisionary eye. The nice thing about this blog is the amount I learn from watching and chatting with smart sartorial minds like yours; the downside is that my early posts suffer from this lack of knowledge! I know this look has polarized some. I’ve attempted it myself a few times with a more dressed-down white shirt and an ’80s-era Haggar “Magic Stretch” suit coat that I picked up at Goodwill. Despite what the sartorial purists say, I like it. Comfortable and good enough for a night out with friends. Yeah agreed, I first thought it was a sports coat or blazer originally but someone pointed out to me that a pinstriped jacket has to be a suit jacket because of the pinstripe and the material. I assumed sports coat since we never see this suit’s trousers anywhere else in the film. Many fashion houses now sell pinstripe “sport coats” that are made from wool suiting, but I’ve discovered that this is a modern, trendy fad that butts heads with the traditional, accepted definition of a sports coat. The more we talk about it, the more I want to get back and start doing some revising! I reckon if we talked to the costume designer and mr Daniel Craig as well, we would find out that the navy pinstripe jacket and rust coloured striped jacket were just Blazers that had no suit pants. A post on the cool rust coloured jacket and jeans should be your next post I reckon. I wonder the same thing, Ryan. I’m hesitant to classify the jackets any definite way until getting some sort of confirmation (which may never come!) I’ve got the scenes featuring the rust pinstripe coat screencapped, so now it’s just a matter of me getting it onto a page here. Perhaps I’ll bump the schedule thanks to your suggestion! Might be a good way to open the discussion to fellow sartorialists. The jackets shoulders are padded not natural, but on the natural shoulder line.